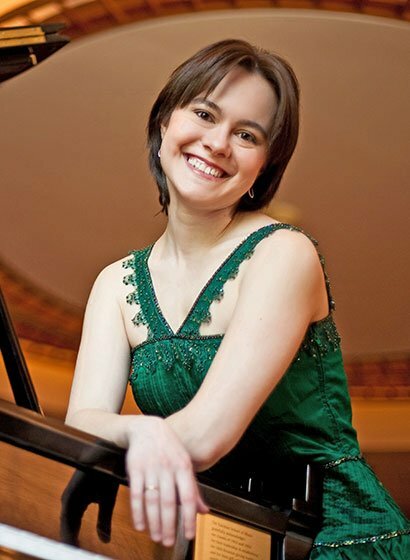 The second of three concerts on the Rising Stars Series at Rockport Chamber Music Festival featured the staggeringly gifted Russian pianist Daria Rabotkina on Tuesday . It was yet another example of how Rockport Music does just about everything right from having the nicest volunteers, the most beautiful hall and scenic backdrop, excellent program notes, to engaging a roster of performers worth the often-challenging ride up to Rockport. The idea of having a not-famous-quite-yet emerging-musicians series has become a popular one. Still, a fully formed artist like Raboktkina, a Rising Star indeed, far surpassed and confounded this listener’s expectations. This was one of the most impressive piano recitals I’ve heard in a long time. Rabotkina devoted the first half of her recital to works hardly intended for a concert grand piano, having started life on the harpsichord, or in the case of Dowland’s “Flow My Teares” (1600), as a song for voice and lute. This famous song has had a busy afterlife, having appeared in transcriptions for numerous instruments and as the theme that appears at the end of a series of variations in Britten’s Lachrymae for viola and piano, viola with orchestra, and, in this writer’s transcription, for viola and harp. The first things one notices about Rabotkina’s playing is its elegance, its lyrical style. Music seems to just pour out of her. Introducing each composition, she spoke engagingly and intelligently. Her long navy dress was simple, her smile radiant. She was spellbinding in everything she played. After her own gentle, touching arrangement of the Dowland, Rabotkina played four selections from Ordre 18éme de clavecin in F Major (1722) by François Couperin with voicing, articulation, grace, and elegance an early music player might well envy. One of Domenico Scarlatti’s E Major Sonatas, K. 162 (composed 1756-57) followed, and her performances holds up with the best of them—with Vladimir Horowitz and Christian Zacharias, my two favorites for this sonata (You can hear her play this on YouTube here). The first half ended with a winning performance of Bach’s popular Italian Concerto (composed circa 1735), a piece Rabotkina admitted had fascinated her since childhood, during which she studied in her hometown of Kazan in Russia with her parents, both concert pianists. Published in 1735 as the first half of Klavier-Übung (the other half was the Overture in the French Style) it was meant to imitate the Italian concerto grosso. But, instead of having opposing instrumental bodies, Bach asked for a two-manual harpsichord that facilitated the dynamic contrasts between forte and piano. Rabodkina’s Bach was full of charm, lyricism and sparkling articulation. Her fast movements (1 and 3) were lively and exciting, her second movement pure poetry. Throughout, her ornamentation sounded both correct and completely natural. Rabotkina’s second half, comprising three virtuoso 20th-century works, was suffused with the lyricism, tasteful phrasing and clean articulation that had graced the first half. Ravel’s “Sonatine” (composed 1903-05) received a ravishing performance (there is an arrangement for harp, flute, and cello/viola by the great harpist Carlos Salzedo that is a favorite among harpists who like to pedal a lot- there are 458 pedal changes in 11 minutes). Rabotnika told the audience a strange story I had never heard. Apparently there was a competition advertised in a short-lived French-English journal, the Weekly Critical Review: “Compose the first movement of a pianoforte sonate in F-sharp minor, not to exceed 75 bars in length.” Ravel’s entry won, but was disqualified, having run to 84 bars. Ravel added two movements, and it became one of his favorites in his own recitals. This was the first of three pieces which left the appreciate Rockport audience in awe. Next, from Rabotkina’s landesman Prokofiev, came the one-movement Sonata No. 3 in A Minor for Piano, Op. 28 (1917). Robotkina played this brilliantly, as she did the final programmed work, Fantasy Suite after Bizet’s Carmen, First Movement, composed by the pianist’s father, Sergei Rabotkin. This 16-minute ‘Movement” has a few distorted snippets of Carmen, but resembles nothing that I’ve come across in the many suites I’ve heard based on this beloved opera. It sounds at times like Rachmaninov, other times like something Marc-André Hamelin might have written and played. Wildly virtuosic, it was yet again another showcase for this amazing young pianist’s chops and musicality. Over the years, I’ve developed a habit of buying the CDs after the concerts of musicians I really liked. Reader, I bought two and am still listening to more. She’s the real thing, and, if life is fair, she should have a spectacular career.